The ‘Costa del Golf’ has been the benchmark for European golf holidays for decades, with some of Europe’s oldest and greatest golf courses found along this glorious stretch of coast. Considering it takes a truly special layout for any young club to make even a slight impact here, it is even more impressive that Finca Cortesin exploded onto the scene when its doors opened in 2007. Finca Cortesin is regarded by many as the most luxurious golf resort in Spain, situated between the beautiful coastal towns of Sotogrande and Marbella, on the road to the beautiful mountain villages of the Casares. While the resort is astounding, the golf course is the crown jewel, ranked in Europe's top 20 courses, and has already hosted the European Tour’s Volvo World Matchplay three times. The par 4, 4th measures in at a tantalising 330 yards meaning that for the longer hitters the green is reachable in 1 and potentially setting up a chance of eagle. However, this classic risk and reward hole is not without danger as the green is very well protected by a large water hazard meaning if your tee shot is not perfect then you will almost certainly be in the drink. The sensible play for this hole would be to hit a long iron off the tee down the right hand side of the fairway leaving you with a short iron into the green taking the water on the left hand side completely out of play. Overlooking the spectacular Costa del Sol shoreline, Finca Cortesin is a special place to play golf. It is here that the remarkable contrast of colours and tones set the scene, and where the designer, along with renowned landscape architect Herald Huggan, has created a true masterpiece. 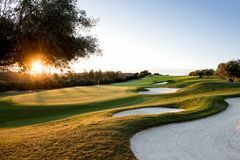 From the championship tees, Finca Cortesin can be extended beyond 7,500 yards, making it a formidable proposition, even for the world’s finest players who enjoyed it as the venue of The Volvo World Matchplay Championship, past winners include Ross Fisher, Ian Poulter and Nicolas Colsaerts. Impeccably manicured fairways are punctuated with bunkers filled with gleaming white sand, creating a stunning visual contrast. While the golf course is monumentally challenging from the back tees, Robinson was at pains to manufacture a layout that could be enjoyed not only by the best golf has to offer but by golf holiday makers of every ability. As such there are tees to suit players of all shapes and sizes. In association with the local area’s golfing delights such as Valderrama, Sotogrande and La Reserva, Finca Cortesin can be included in a golf tour of the very highest order that will rival anything in Europe or indeed the rest of the world. The hotel at this incredible resort is comprised of 67 luxurious rooms which are the perfect resting place for any golfer's visiting the area on a golf trip. The suites are extremely spacious and come equipped stunning furniture giving the rooms an elegant décor which are the hallmarks of this landmark hotel, which has redefined the landscape in southern Spain for golf holidays. Each of the rooms have their own private garden or balcony which is the perfect place for guests to soak up the spectacular and marvel in the incredible vistas from the comfort of their own room. The hotel is also just a chip and putt away from the course meaning your next round on this glorious golf course is never too far away. However, this stunning resort is not just the ideal destination for travelling golfers but also for those looking for a luxury spa beak. The new state of the spa facility is an oasis of tranquillity and contains 3 separate areas for face and body treatments. There are a number of unique options for guests to choose from all of which are designed to revitalise your skin and refresh your mind and soul. The Spa also offers a number of different massage therapies meaning that golfer's can use the spa too in order to freshen up before their next round of golf. Finca Cortesin’s Resort boasts two incredible restaurants. The El Jardín de Lutz serves traditional Spanish cuisine and Kabuki Raw which in addition to its pure orthodox Japanese dishes offers others that have emerged as a result of Japanese and Mediterranean influences. El Jardín de Lutz offers a more relaxed yet equally elegant ambiance for guests who prefer a more traditional Spanish cuisine. In its interior, the restaurant showcases tall ceilings, clay tiled floors, antiques and Portuguese painted tiles. In the outdoor space, the restaurant features a spectacular terrace with views to the Mediterranean and picturesque gardens filled with 1000-year old olive trees. Kabuki Raw is the hotel's signature restaurant and is managed by the Kabuki Group, world leader in Japanese cooking with fiverestaurants and a total of three Michelin stars. Course was not in great condition? practice tees where not grass? Drinks lady disappeared after the front 9? Will not be going back. What an experience. The best course I have ever played. EVER. Worth the extra money, this will be the first pick on my next booking. Q – How much does a 1 hour golf lesson cost at Finca Cortesin Golf Resort 5*? A – A 1 hour golf lesson with a PGA Professional at Finca Cortesin Golf Resort 5* would cost you 120 euros. The driving range is located just a few metres from the clubhouse so makes a dramatic setting for a lesson. A – Buggies are available for hire and can be reserved when booking your tee time. Q – When is the best time of year to play Finca Cortesin? A – July and August are the hottest months in the Costa del Sol with the temperatures averaging 26 degrees Celsius. So if you are looking for some golf in the sun, this is the perfect time to visit. With great weather still to be had in the autumn months in Spain it is certainly a destination that is worth considering at any time of the year. Q – Can I take a spa break here as a non-golfer? A – The hotel at Finca Cortesin is one of the best in Spain and offers a state-of-the-art spa and wellness facility enabling a relaxing environment for golfer and non-golfers to enjoy as part of their holiday.